Welcome to This Week in Cascadia April: 29th – May 5th! later. Within days, the East Wenatchee airfield is named Fancher Field in his honor. Community Center at 304 Lincoln Avenue in Mukilteo. May 3, 1941 – The Columbia River Bridge at Kettle Falls, near completion, opens to traffic. The steel cantilever bridge carries Route 395 across the river above the Grand Coulee Dam in Kettle Falls, Washington. It is one of two highway bridges (and one railroad bridge) constructed to replace bridges flooded by waters rising behind the dam to form Roosevelt Lake. The bridge has the distinction of having the longest central span of any highway bridge built in Washington during the 1940s. In 1995 the steel truss bridge will be added to the National Register of Historic Places. The Oregon cities of Astoria and Seaside had been connected by railroad since 1890. With the completion of the Portland link, tourists began arriving on the coast in droves.Seaside became a resort town, expanding from hundreds of residents to thousands during the summer months, while Astoria becomes an important hub for the timber industry, which now had access to the forests of the Coast Range. 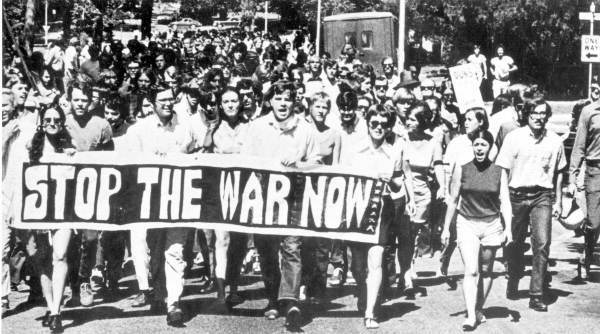 May 5, 1970 – An estimated 1,000 people in Seattle surge onto southbound lanes of the Interstate 5 Freeway to protest the recent American invasion of Cambodia and the deaths of four antiwar protesters on the Kent State campus in Ohio the previous day. The protest began that morning on the campus of the University of Washington. A large mass of demonstrators then left campus and marched north on University Way NE. They turned west on NE 45th St. and approximately 1,000 entered the freeway. The group halted all traffic as they moved south over the Freeway Bridge. They were met on the far side by a handful of State Troopers and exited peacefully at the Roanoke Street off-ramp. Next ArticleUpcoming Cascadia Events for the Summer!